When I pack for a trip, I make a list and check it off as I go. If I don’t, I forget things. If I forget things, no one else remembers them instead. That’s just how it is in our family. I’m in charge of packing, and my husband is in charge of planning. It works for us. The problem is, I’m what I like to call a reasonable overpacker. I like to be SUPER prepared in the event that we encounter bad weather, an accident, or the plague. So, when I prepared for our week long trip for snowmobiling and skiing, my list was quite long. What I was surprised to notice as I was packing, though, was the huge number of BALM! Baby products I felt like we couldn’t leave without! After all, I’d only just begun using their products about a month ago. I’ve learned a lot about them since then, and I definitely sing their praises. One of the great things about BALM! Baby is their packaging. When a skin care product is poured into a plastic container at high heat, the chemicals in the plastic can leach into the product itself. So when you go to apply that product to your baby’s skin (their largest organ) they don’t just absorb the product, but the toxins from the plastic as well. Not to mention, plastic is recyclable, but not infinitely so the way glass and aluminum are- eventually it ends up in the dump. When the owners of BALM! Baby were expecting their first child, they realized that there weren’t any natural care products for baby on the market that were not sold in plastic containers, so they began to make their own. BALM! Baby (part of the parent company Taylor’s Pure and Natural) makes an entire line of natural care products for mom and baby that are stored in infinitely recyclable containers that will not leach toxic chemicals into their products. The Teeth Paste is a thick but light (think marshmallow fluff but runnier) white tooth paste that is available in three flavors. We tried the Sweet Orange and found that it tastes like orange circus peanuts almost- sweet but light; the flavor is not too strong for little ones. Also, they don’t use sugar to sweeten the paste, they use xylitol- a sweet, natural substance that is proven to also be beneficial for dental health. 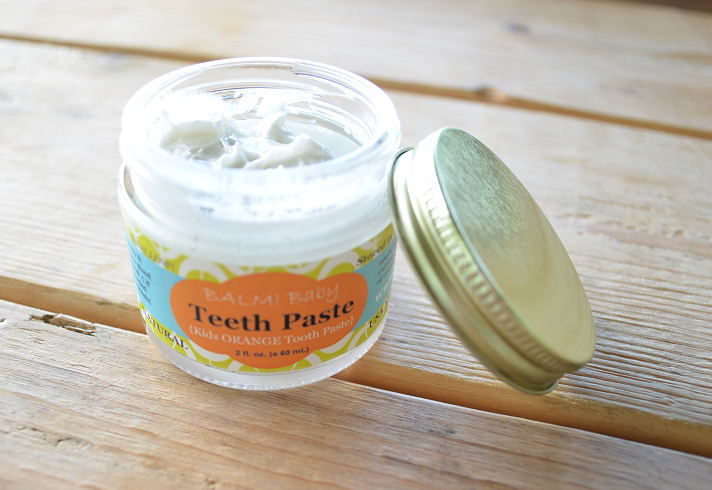 The paste is not gritty like some toothpastes are, and it’s gentle and safe enough to use on little mouths. I was honestly surprised how clean my teeth and gums felt after using it. I was expecting to feel like my mouth wasn’t cleaned as well since there was no grit to the toothpaste, but I was wrong. Now, since the flavor we chose was the Sweet Orange, I didn’t have that fresh, clean, after-brushing tingle of mint, but I’m sure if I’d tried the mint flavor that would be another story. I felt like the paste did a great job on Lucas’ teeth as well; however, he wasn’t a fan of the orange flavor. I love the idea of the glass jar because it takes up way less space on the counter than the traditional tube of toothpaste, and it’s more aesthetically pleasing. However, at first I didn’t feel like there was a good way to go about getting the paste onto the toothbrush other than either dipping it into the jar, which I felt was contaminating the rest of the paste, or using some sort of tool like a plastic spoon to scoop it out, which is inconvenient. What I ended up doing was wiping the paste onto the brush off of the lid, but it was still not as convenient as a product that comes in a tube. BALM! 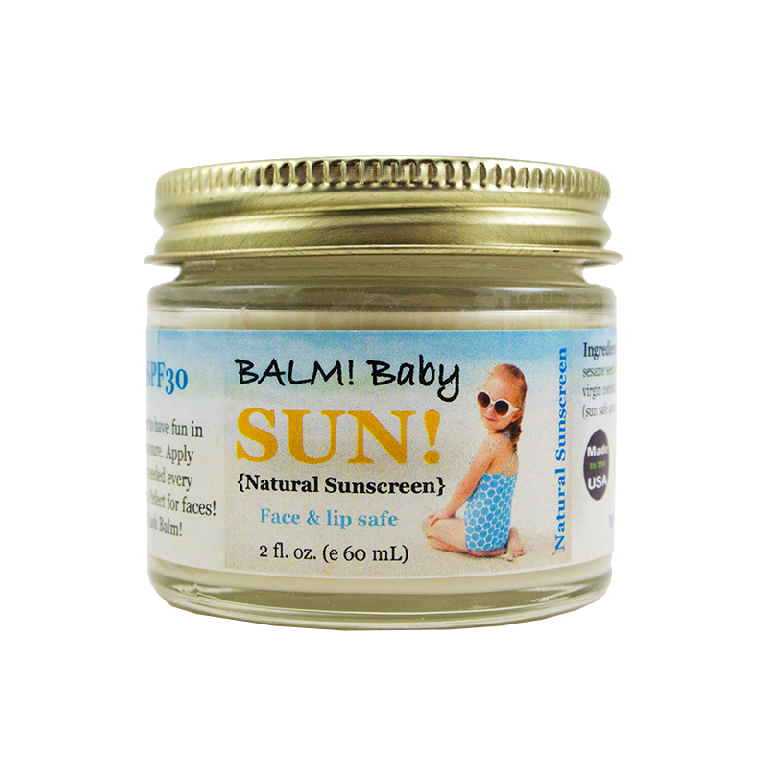 Baby Sun is a natural mineral sunscreen that is safe for all ages and is safe for baby’s face. It contains 25% NON-nano zinc, meaning the zinc particles are not small enough to infiltrate through the skin; they stay on the surface to create a natural barrier to the sun’s harmful UV rays. The thick white paste is no messier to apply than most other sunscreens, and it does not rub in all the way to create a seemingly invisible barrier the way some sunscreens do (thanks to the NON-nano zinc), which makes it easier to tell where you’ve missed a spot or two! The smell isn’t overpowering at all, and it worked very well for us. Playing out in the snow in the wintertime requires sunscreen too, you know! The only thing I didn’t like about it is that you have to remember to apply it 30 minutes before sun exposure. I’m used to putting on sunscreen right before going out to be in the sun, so that was hard for me to remember ahead of time. One of the really cool things about this sunscreen is that BALM! Baby can customize the ingredients for you if you are allergic to the nut oils used in the standard version of this product! How cool is that? I’d definitely purchase this to use again. The Eucalyptus Rub is a smooth, thick, light green balm with the consistency and feel of something similar to vapor rub without the crazy, overpowering smell. The gentle yet effective eucalyptus scent is great for two things: opening up clogged sinuses and reducing nausea due to motion or morning sickness, and it can also be used for relieving sore muscles. 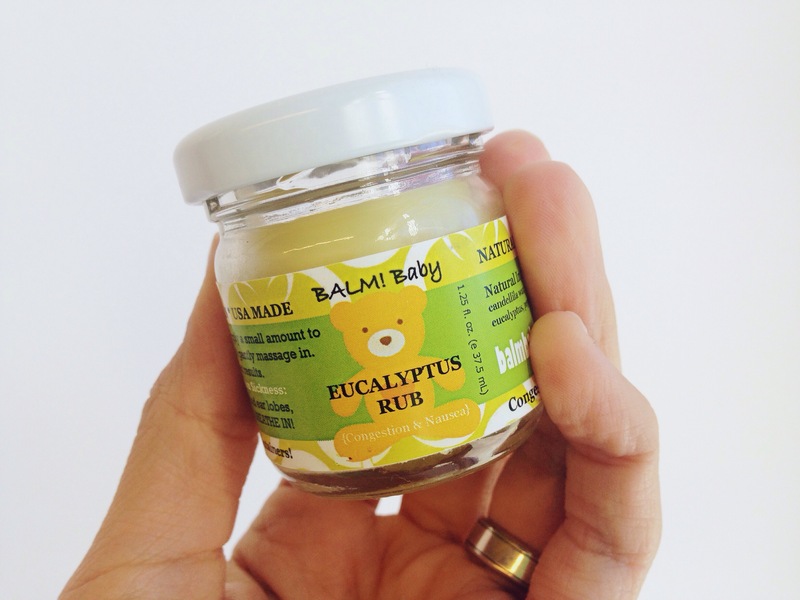 It’s baby safe (beginning at 3 months old) and is a topical rub used on the chest, back, tummy, or under the nose. I loved it. The smell of vapor rub always makes me choke, and then I feel like everything it touches is tainted forever with the smell of sickness. The Eucalyptus Rub is scented enough to do the job, but it’s not super overpowering in the way that vapor rub is. Thankfully, Lucas has not been sick for me to test it out on him (probably because we’ve been using the BALM! Baby Be Well Stay Well Tincture too), but I’ve been able to use it on myself more than once this winter already. I opt for rubbing it onto my chest because I felt like under the nose was too much for me. It was cooling but not in a strongly alarming way the way some rubs are. It was very soothing for my chest congestion and stuffy nose. Once my congestion let up, my sinus headache went away too. Win win! I’ll definitely be purchasing more once our jar runs out, but it seems like that will be a long while! A little goes a long way! A mist spray for your lady bits, pads, underwear, and more- it freshens and moisturizes daily or when you are uncomfortable during pregnancy, and it can also heal post-partum soreness using a blend that includes alcohol-free witch hazel and aloe vera juice. It is available in three different scents or also unscented, but I received the Lavender scent to review. I was always told the less you mess with “down there” the better in order to avoid infections. So, I didn’t think I’d like it before I tried it because I worried it would just make me feel wet and soggy or something; you know, like how wearing damp underwear is uncomfortable. That’s the opposite of how I felt after using it. I felt refreshed, lightly scented in a non-perfume-y way (like it didn’t mask odor; it eliminated it without being overpowering) and I just felt cleaner. It didn’t incite any infections of any kind either. My favorite time to use it is during shark week, but honestly I could use it whenever. I have a feeling that this summer it will be especially helpful on super hot and sweaty days (c’mon, be honest, you know you understand). I would strongly recommend this as a must have for all women! Overall, I absolutely loved these BALM! Baby products. I was impressed with their company and their dedication to health and the environment and was equally impressed with the prices and the quality of their products. Be sure to shop for BALM! Baby next time you shop with us at Dream Diapers and make them must haves for your everyday and when you leave on vacation! *BALM! Baby sent me these products to review, but the opinions are 100% my own: Muffin Mist, Teeth Paste, Eucalyptus Rub, and BALM! Baby Sun. Next Post Our Top 10 Products You LOVE! I’m dying to try more of their products! I definitely have to add the teeth paste to my list now! Definitely! What products have you tried already, Carmen?